The Clowes Collection has been exhibited for nearly half a century in the Clowes Pavilion at the Indianapolis Museum of Art (IMA) at Newfields. The IMA's acclaimed collection of European painting and sculpture comprises more than 500 works from the 12th through the 18th century, ranging in style from the Romanesque to the Rococo. Nearly one-fifth of these works constitute the Clowes Collection, recognized for its concentration of masterworks of the Italian, Spanish, Netherlandish and German schools. Notable pieces within the Collection include Self-Portrait by Rembrandt van Rijn, Triumphant Entry of Constantine into Rome by Peter Paul Rubens and The Flight into Egypt by Claude Lorrain. Dr. George H.A. Clowes and Edith Whitehill Clowes developed the Collection through purchases dating back to the 1930s, further developed in later years with the assistance of their two sons, most notably Allen Clowes. For decades, these paintings and objects graced their home, Westerley, in Indianapolis, Indiana. Following Dr. Clowes's death in 1958, the Collection became property of The Clowes Fund and was first exhibited to the public at the John Herron Art Museum in 1959. Public viewings at Westerley followed until April 1972, when the Clowes Pavilion at the IMA was dedicated in memory of Edith Whitehill Clowes. The image above left shows El Greccos (St. Matthew, St. Simon, St, Luke) on the back wall in Westerley, the Clowes family historic home; the center image shows the Clowes family on opening night of Clowes Memorial Hall on the settee in front of the El Greccos; the image above right shoes the same El Greccos displayed in the Clowes gallery of the IMA at Newfields. The late Alec Clowes, long-time president of The Clowes Fund, recalling his active involvement in the creation and design of the Clowes Pavilion, once said, "With a goal to recreate the original setting of the pictures at Westerley, we spent time replicating the study and drawing room—the two main rooms where art was displayed." He had a special affinity for the Clowes Pavilion because it was his first and most memorable experience as a Clowes Fund director. Alec had said the Fund "made sure to spend the time, money, and effort necessary to create an interior to house the Collection rather than distribute art pieces around the museum." The Clowes Fund's board of directors is committed to transferring ownership of the entire Collection to the IMA over the next few years. The approximate value of pieces transferred to the IMA to date is slightly more than $28 million. 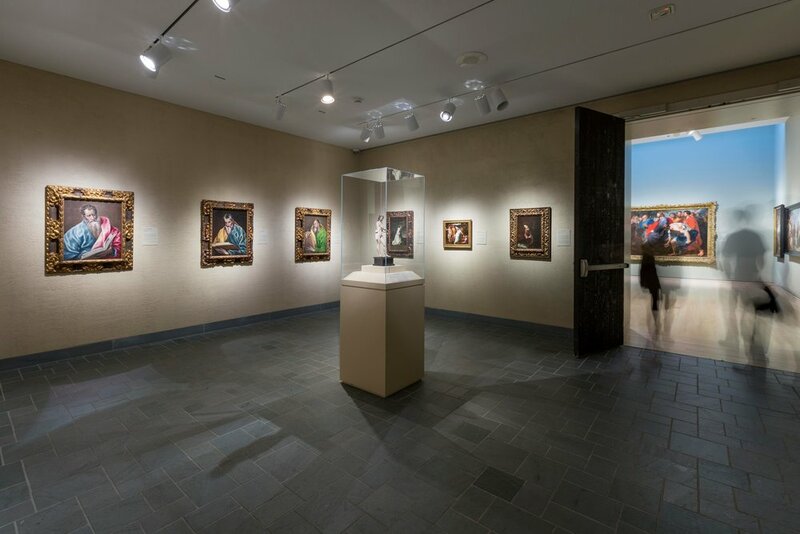 In addition to the Collection, the Fund's paid contributions to the IMA over the years have included approximately $5.9 million for construction and maintenance of the Clowes Pavilion and the Collection, plus an endowment of $500,000 in 1999 to establish the Allen Whitehill Clowes Curatorial Fellowship. In 2016, The Clowes Fund and the Allen Whitehill Clowes Charitable Foundation joined forces to meet the IMA's needs in terms of care and maintenance of "all things Clowes" at the museum; each foundation awarded $1.5 million to be paid 2017–2021. Clowes Fund ownership of the following eleven items was transferred to the IMA in 2018. Click on an item to access the full name, artist, provenance and object details for that item as documented by the IMA. In preparation for its 50th anniversary, the Pavilion closed for extensive renovation in July 2018; it will reopen in the spring of 2021. This year will also mark the completion of a new scholarly publication on the paintings in the Collection, the first to be published since Ian Fraser's 1973 A Catalogue of the Clowes Collection. It will be extensively illustrated and include in-depth entries on each major work, many authored by former Clowes Curatorial Fellows , along with full conservation reports. To provide the greatest possible access to this new scholarship, the catalogue will be published digitally and appear on Newfields’ website. The Allen Whitehill Clowes Fellowship supports the scholarship and professional development of outstanding junior scholars who wish to pursue curatorial careers in art museums. Since 1999, Clowes Fellows have conducted scholarly research related to the Collection and gained curatorial training in the field of European painting and sculpture. Watch as brothers Alec and Jon Clowes reminisce with Ian Fraser, raconteur extraordinaire and former longtime curator of the Clowes Collection, about the art and their family (circa 2010). We extend our congratulations on several recent staff changes at the IMA at Newfields. Most recently, Roxane Sperber joined the museum as the Clowes associate conservator of paintings. Her experience includes serving as the Andrew W. Mellon Fellow in Paintings at the Worcester Art Museum and as a research conservator in the Technical Studies Lab at Yale’s Institute for the Preservation of Cultural Heritage. In 2017, Annette Schlagenhauff was promoted to curator of European Art. In her previous position, Schlagenhauff served as the IMA’s curator of special projects, curating several exhibitions and leading provenance research efforts at the museum. Also in 2017, Kjell Wangensteen was named assistant curator of European art. Before coming to the IMA, he was the Samuel H. Kress Predoctoral Fellow at The Morgan Library & Museum and the 2014–2015 Theodore Rousseau Curatorial Fellow in the department of European paintings at the Metropolitan Museum of Art. Founded in 1883, the Indianapolis Museum of Art at Newfields now boasts a permanent collection of more than 54,000 works of art that span the range and scope of art history. In addition to housing its world-class art collections, the museum is also a premier showcase for national and international exhibitions. For more than 130 years, it has served the community of Indianapolis through its collections and programs. In August 2017, the IMA campus debuted as Newfields, offering dynamic experiences with art and nature for guests of all ages. The 152-acre cultural campus features art galleries, lush gardens, a historic home, performance spaces, a nature preserve and sculpture park. From inspiring exhibitions in the IMA Galleries, to concerts in The Toby, to a stroll through The Garden with a glass of something cold, guests interact with art and nature. Newfields is home to the Indianapolis Museum of Art, among the ten largest and ten oldest general art museums in the nation; the Lilly House, a National Historic Landmark; The Garden, featuring 40 acres of contemporary and historic gardens, a working greenhouse and an orchard; and The Virginia B. Fairbanks Art & Nature Park: 100 Acres, one of the largest art and nature parks in the country. The Newfields campus extends outside of Indianapolis with Miller House and Garden in Columbus, Indiana—one of the nation’s most highly regarded examples of mid-century Modernist architecture.